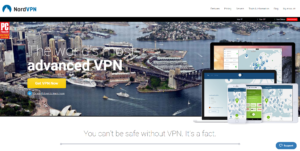 NordVPN Review - Australian VPN Review + A FREE GIFT! Welcome to our NordVPN review, where we take a closer look at the gold-standard for VPNs. NordVPN has servers across the world, including Australia, which makes them a solid choice for those who aren’t trying to fool region-locked websites as well as those who are using a VPN to access region-locked services such as Netflix. Their prices, on the face of it, are roughly in the middle of what we’ve seen, but the bang-for-buck ratio is simply incredible, as you’ll see later in the review. They have a single account level and three billing options. Simple will cost you US$8/month billed every month, while Standard will cost you US$7/month, billed as US$42 every six months, and their one-year plan will run you US$5.75/month, billed as US$69 annually. They accept payment via a wide array of methods, including Bitcoin. Remember that the prices are in US dollar, and your bill may fluctuate according to the exchange rate. They offer a 30-day money-back guarantee, but only if the service doesn’t work, and a three-day free trial which you can contact Support to receive. NordVPN offers six simultaneous connections with their standard package, which is better than most service’s top-tier offerings, most of whom offer only five. NordVPN also offers double encryption on your data, which they call DoubleVPN. They also offer DoubleVPN with their Tor over VPN solution, which sends your traffic over the Tor network to increase security. Read more about Tor and how the Tor project works at https://www.torproject.org/. Running your traffic through Tor is optional, and often has a terrible effect on browsing speeds, but that’s the price that must be paid for complete anonymity online. NordVPN also protects against DNS leaks, which will keep you safe from censorship, filtering, man-in-the-middle attacks, and most of the things unscrupulous people can do to unsecured DNS traffic. During NordVPN review testing, the service performed adequately in terms of NordVPN’s effect on browsing speeds and latency, quite a bit slower than the best, but still faster than the worst. NordVPN is based in Panama, which has no data-retention laws, and has a zero-logging policy. NordVPN’s apps are a delight to use, lightweight and with clear options. They offer apps for iPhone, Android, Windows, Mac, certain gaming consoles and Smart TVs, and routers. Easy to use. Their apps are lightweight and easy to use, and make selecting the right server easy. No logging. They don’t keep any logs of their clients’ Internet usage, and so they cannot be forced to provide any information about their clients to the authorities. Tor over VPN. They have support for using the Tor network over the VPN, for when normal paranoia just isn’t cutting it. Kill switch. Their kill-switch feature will shut down active connections if your VPN drops, so you’re never at risk of accidentally exposing your data. Multiple devices. NordVPN offers support for more simultaneous connection than any VPN we’ve seen yet. P2P friendly. NordVPN does not throttle or otherwise prohibit P2P or Bittorrent traffic. Netflix friendly. NordVPN is committed to making sure that their service continues to work with Netflix. You won’t have to disable your security to catch up with Game of Thrones with this service. Basically, our NordVPN review concludes that NordVPN is, and remains, the gold standard when it comes to VPN services. With a feature-rich service and a pocket-friendly price tag, NordVPN is one of the best options you will find for your Internet security. They do not, however, remove ads from website you visit, as many other VPN providers do. We hope that you found our NordVPN review useful. Comments, questions, concerns? Let us know in the comments below. One of the best VPN services money can buy. Highly recommended. Almost 5/5 however there was a VERY slight scoring penalty on their speed rating, but it is not slow by any means.